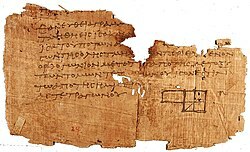 Euclid of Alexandria (Greek: Εὐκλείδης) (about 325 BC–265 BC) was a Greek mathematician who lived in Alexandria, Egypt and worked at the Library of Alexandria. Little is known about this person, but people think he lived there when Ptolemy I was Pharaoh. It is not known where and when he was born. One of the oldest surviving fragments of Euclid's Elements, dated to circa AD 100. The diagram accompanies Book II, Proposition 5. This page was last changed on 17 April 2019, at 20:05.